Broom Hockey - Broom Ball - Not cold outside? Don't have your own ice rink, but love to play hockey? Here's the solution! With our floor hockey arena, everyone can have fun sliding around in their socks, trying to score a goal! Broom Hockey - Broom Ball - Floor Hockey - Not cold outside? 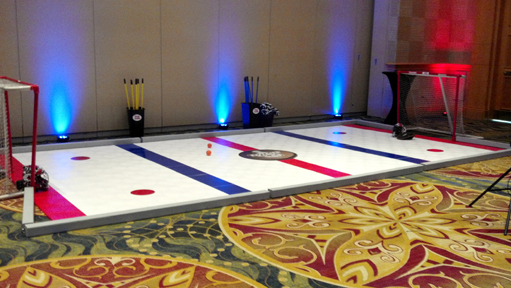 Don't have your own ice rink, but love to play hockey? Here's the solution! With our floor hockey arena, everyone can have fun sliding around in their socks, trying to score a goal! Includes: hockey floor, wooden bumper rails, 12 brooms (or floor hockey sticks), balls, 2 goals, 2 goalie helmets, goalie gloves, and 1 attendant. Custom Center Ice logo sticker can be added for an additional fee.